Unlike so many of its longsuffering architectural brethren, the 4.5 acre historic homestead of the Dickson-Farm was spared from the wrecking ball by farsighted Village of Montgomery officials. While they wanted to keep it from being razed by developers, the Village did not have a specific use for the site. The site was sold to The Conservation Foundation in 2006. At that time, Kendall County was one of the fastest growing counties in the United States, and to give conservation a voice in the face of rampant development, we needed to be present on the front lines. A year prior to this purchase, we had initiated Protect Kendall Now!, an intense land conservation effort specific to Kendall County. Our new office space in the Dickson-Murst farmhouse allowed us to become part of the community, and be part of the conversation where land use issues were concerned. Along with a roomy farmhouse for office space, we acquired several beautifully kept farm buildings in the purchase. But preserving beautiful old buildings, while a very worthy cause, is not the Foundation's mission, and the maintenance of these building was a concern. Some creative, out-of-the-box thinking brought together a number of community individuals and groups who agreed to maintain the farm's outbuildings in return for the use of the space for various cultural and community activities. The Foundation uses the main house as an office, while the Dickson-Murst Farm Partners maintain the outbuildings, which were kept in pristine shape by the farm's former owners. 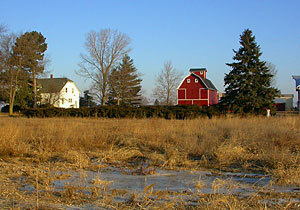 The farm is located on Dickson Road, just one mile south of Route 30 and one mile east of Route 47. Former Montgomery Village President Marilyn Michelini was a driving force behind the protection of the Dickson Road site. "In all my years serving the public, I've always said if I do nothing else, I'd like to find a farm in good condition to preserve," Michelini said. "The rural life is one that is quickly disappearing, and if we don't protect some of it today, it's all going to be lost." Though now surrounded by homes, the Dickson-Murst Farmstead still stands as an icon of days gone by and a campus from which we work to preserve our natural and agricultural heritage for future generations. Read here about the solar panels at the Dickson-Murst Farm, donated and installed by WCP Solar of Naperville. These panels will provide approximately half of the farm's electrical needs. Jason and David Rubenstein were kind enough to put together this aerial video tour of our Dickson-Murst Farm using their drone camera. Our thanks to both of them. Enjoy!